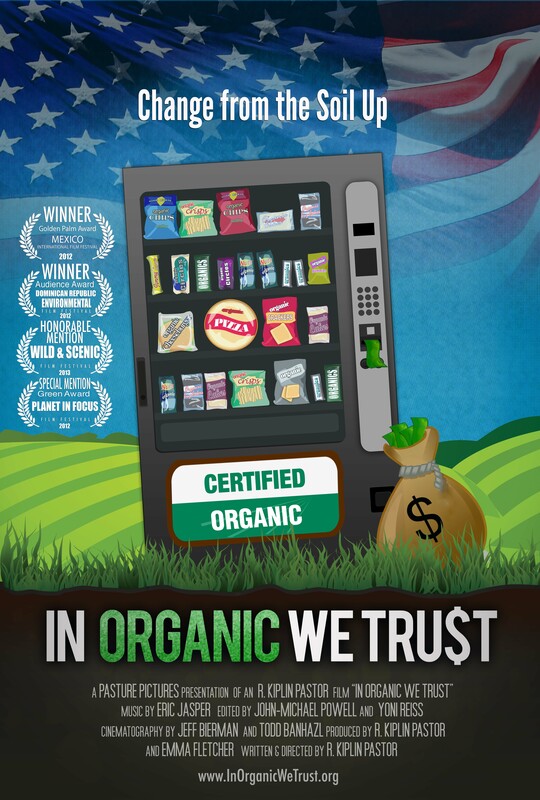 In Organic We Trust is an eye-opening food documentary that follows Director/Producer Kip Pastor on a personal journey to answer commonly asked questions about organic food: What exactly is organic? Is it really better, or just a marketing scam? The film digs deep with farmers, organic certifiers, scientists, and organic critics to explore the content beneath the label and the truth behind the marketing. It takes a balanced approach to clear up misconceptions about organic food while highlighting practical solutions that are transforming the way we grow and eat. Along the way, Kip learns that what began as a grassroots movement of small-scale farmers has turned into a $30 billion industry. Small, diversified organic farms have been replaced by large corporate operations and the “certified organic” label has become a marketing tool. The film reveals that in spite of the corporatization of organic, the original grassroots philosophy is making a comeback in many innovative forms. Realizing that organic is not the all-encompassing solution to our health and environmental problems, Kip travels all over the country to unearth inspiring stories of local family farmers dedicated to stewardship of the land, a thriving “locavore” subculture centered on farmer’s markets, chefs feeding children healthy school meals, and urban and school gardens sprouting up to bring fresh food to low-income communities. Individual citizens and communities are taking matters into their own hands and change is happening from the ground up.